Last modified on Friday, December 22 2006. A Greek female deity was gouged in the axilla by a Narwhal 6 weeks ago. 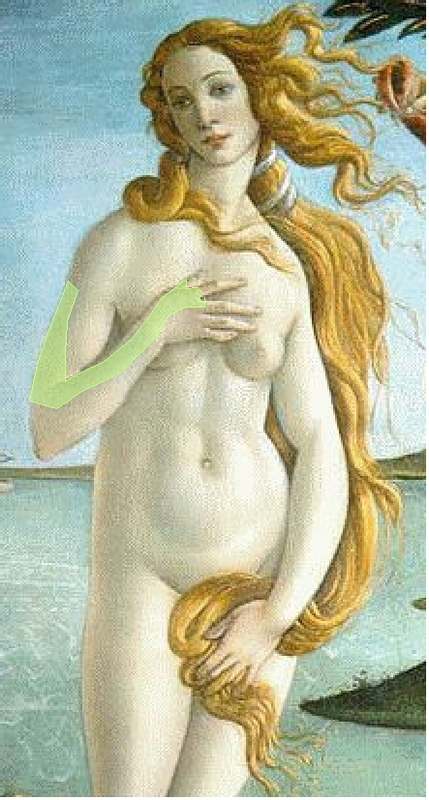 She presents to your clinic today complaining of numbness in the area shaded in green in the image above. She also, as pictured, is unable to extend her arm at the elbow. Abduction at the shoulder has been spared. Needle EMG is likely to show fibrillations in which of the following muscles? This question was last modified on December 22, 2006. 1. Preston, D.C., and Shapiro, B.E. (2005). Electromyography and Neuromuscular Disorders: Clinical-Electrophysiologic Correlations, 2nd Edition. Elsevier, Philadelphia. Pp. 663-666. 2. Bickley, L.S., and Hoekelman, R.A. (1999). Bates' Guide to Physical Examination and History taking, 7th Edition. Lippincott, Philadelphia. Pp. 163-244.